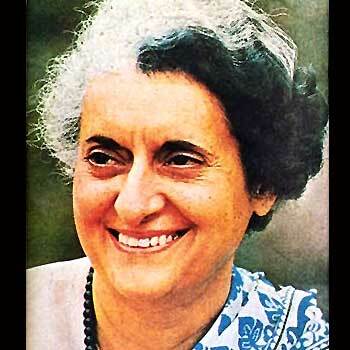 Indira Gandhi was the only child of Indian Prime Minister Jawaharlal Nehru. She served as the Chief of Staff of her father's highly centralized administration between 1947 and 1964 and came to wield considerable unofficial influence in government. Elected Congress President in 1959, she was offered the premiership in succession to her father. Gandhi refused and instead chose to become a cabinet minister in the government. She finally consented to become Prime Minister in succession to Lal Bahadur Shastri in 1966. As Prime Minister, Gandhi became known for her political ruthlessness and unprecedented centralisation of power. She presided over a period where India emerged with greater power than before to become the regional hegemon of South Asia with considerable political, economic, and military developments. Gandhi also presided over a state of emergency from 1975 to 1977 during which she ruled by decree and made lasting changes to the constitution of India. She was assassinated in the aftermath of Operation Blue Star. Her father, Jawaharlal Nehru, led India's political struggle for independence from British rule, and became the first Prime Minister of the Union (and later Republic) of India. She was an only child (a younger brother was born, but died young), and grew up with her mother, Kamala Nehru, at the Anand Bhavan; a large family estate in Allahabad.Indira had a lonely and unhappy childhood.] Her father was often away, directing political activities or being incarnated in prison, while her mother was frequently bed-ridden with illness, and later suffered an early death from tuberculosis. She had limited contact with her father, mostly through letters. Gandhi fasting in 1924, with the young Indira, who is dressed in a khadi garment, following Gandhi's advocacy that khadi be worn by all Indians instead of British-made textiles. During her time in Europe, Ms. Indira was plagued with ill-health and was constantly attended by doctors. She had to make repeated trips to Switzerland to recover, disrupting her studies. She was being treated by the famed Swiss doctor Auguste Rollier in 1940, when the Nazi armies rapidly conquered Europe. Indira tried to return to England through Portugal but was left stranded for nearly two months. She managed to enter England in early 1941, and from there returned to India without completing her studies at Oxford. The university later conferred on her an honorary degree. In 2010, Oxford further honored her by selecting her as one of the ten Oxasians, illustrious Asian graduates from the University of Oxford. During her stay in the UK, young Indira frequently met her future husband Feroze Gandhi, whom she knew from Allahabad, and who was studying at the London School of Economics. The marriage took place in Allahabad according to Adi Dharm rituals though Feroze belonged to a Parsi family of Gujarat. When Indira became Prime Minister in 1966, the Congress was split in two factions, the socialists led by Gandhi, and the conservatives led by Morarji Desai. Rammanohar Lohia called her Gungi Gudiya, which means 'Mute Doll'. The internal problems showed in the 1967 election where the Congress lost nearly 60 seats winning 297 seats in the 545-seat Lok Sabha. She had to accommodate Desai as Deputy Prime Minister of India and Minister of Finance. In 1969, after many disagreements with Desai, the Indian National Congress split. She ruled with support from Socialist and Communist Parties for the next two years. In the same year, in July 1969 she nationalised banks. In 1971, Gandhi intervened in the Pakistani Civil War in support of East Pakistan. India emerged victorious in the resulting conflict to become the regional hegemon of South Asia. During the war, the U.S. had supported Pakistan, while India received help from the Soviet Union. U.S. President Richard Nixon disliked Gandhi personally, referring to her as a "witch" and "clever fox" in his private communication with Secretary of State Henry Kissinger. Relations with the U.S. grew distant as Gandhi developed close ties with the Soviet Union after the war. The latter emerged to become India's largest trading partner and its biggest arms supplier for much of Gandhi's premiership.Nixon later wrote of the war: "[Gandhi] suckered [America]. Suckered us.....this woman suckered us." India's new hegemonic position as articulated under the "Indira Doctrine" led to attempts to bring the Himalayan states under the Indian sphere of influence.Nepal and Bhutan remained aligned with India, while in 1975, after years of building up support, Gandhi annexed Sikkim to India. This was denounced as a "despicable act" by China. India maintained close ties with neighbouring Bangladesh (formerly East Pakistan) following the Liberation War. Prime Minister Sheikh Mujibur Rahman recognized Gandhi's contributions to the independence of Bangladesh. However, Mujibur Rahman's pro-India policies antagonised many in Bangladeshi politics and the military, who feared that Bangladesh had become a client state of India. The Assassination of Mujibur Rahman in 1975 led to the establishment of Islamist military regimes that sought to distance the country from India. Gandhi's relationship with the military regimes was strained, due to her alleged support of anti-Islamist leftist guerrilla forces in Bangladesh. Generally, however, there was a rapprochement between Gandhi and the Bangladeshi regimes, although issues such as border disputes and the Farakka Dam remained an irritant in bilateral ties. In 2011, the Government of Bangladesh conferred its highest state award posthumously on Gandhi for her "outstanding contribution" to the country's independence. Gandhi's approach to dealing with Sri Lanka's ethnic problems was initially accommodating. She enjoyed cordial relations with Prime Minister Sirimavo Bandaranaike. In 1974, India ceded the tiny islet of Kachchatheevu to Sri Lanka in order to save Bandaranaike's socialist government from a political disaster. However, relations soured over Sri Lanka's turn away from socialism under Junius Jayewardene, whom Gandhi despised as a "western puppet. "India under Gandhi was alleged to have supported LTTE militants in the 1980s to put pressure on Jayewardene to abide by Indian interests.Nevertheless, Gandhi rejected demands to invade Sri Lanka in the aftermath of Black July 1983, an anti-Tamil pogrom carried out by Sinhalese mobs.Gandhi made a statement emphasizing that she stood for the territorial integrity of Sri Lanka, although she also stated that India cannot "remain a silent spectator to any injustice done to the Tamil community." India's relationship with Pakistan remained strained following the Shimla Accord in 1972. Gandhi's authorization of the detonation of a nuclear device at Pokhran in 1974 was viewed by Pakistani leader Zulfikar Ali Bhutto as an attempt to intimidate Pakistan into accepting India's hegemony in the subcontinent. However, in May 1976, Gandhi and Bhutto both agreed to reopen diplomatic establishments and normalize relations. Following the rise to power of General Zia-ul-Haq in Pakistan in 1978, India's relations with its neighbour reached a nadir. Gandhi accused General Zia of supporting Khalistani militants in Punjab. Military hostilities recommenced in 1984 following Gandhi's authorization of Operation Meghdoot. India was victorious in the resulting Siachen conflict against Pakistan. Gandhi remained a staunch supporter of Palestinians in the Arab-Israeli conflict and was critical of the Middle East diplomacy sponsored by the United States. Israel was viewed as a religious state and thus an analogue to India's arch rival Pakistan. Indian diplomats also hoped to win Arab support in countering Pakistan in Kashmir. Nevertheless, Gandhi authorized the development of a secret channel of contact and security assistance with Israel in the late 1960s. Her lieutenant, Narasimha Rao, later became Prime Minister and approved full diplomatic ties with Israel in 1992. India's pro-Arab policy had mixed success. Establishment of close ties with the socialist and secular Baathist regimes to some extent neutralized Pakistani propaganda against India. However, the Indo-Pakistani war in 1971 put the Arab and Muslim states of the Middle East in a dilemma as the war was fought by two states both friendly to the Arabs. The progressive Arab regimes in Egypt, Syria, and Algeria chose to remain neutral, while the conservative pro-American Arab monarchies in Jordan, Saudi Arabia, Kuwait, and United Arab Emirates openly supported Pakistan. Egypt's stance was met with dismay by the Indians, who had come to expect close co-operation with the Baathist regimes. But, the death of Nasser in 1970 and Sadat's growing friendship with Riyadh, and his mounting differences with Moscow, constrained Egypt to a policy of neutrality. Gandhi's overtures to Muammar Gaddafi were rebuffed. Libya agreed with the Arab monarchies in believing that Gandhi's intervention in East Pakistan was an attack against Islam. The 1971 war temporarily became a stumbling block in growing Indo-Iranian ties.] Although Iran had earlier characterized the Indo-Pakistani war in 1965 as Indian aggression, the Shah had launched an effort at rapprochement with India in 1969 as part of his effort to secure support for a larger Iranian role in the Persian Gulf. Gandhi's tilt towards Moscow and her dismemberment of Pakistan was perceived by the Shah as part of a larger anti-Iran conspiracy involving India, Iraq, and the Soviet Union. Nevertheless, Iran had resisted Pakistani pressure to activate the Baghdad Pact and draw in the Central Treaty Organisation (CENTO) into the conflict. Gradually, Indian and Iranian disillusionment with their respective regional allies led to a renewed partnership between the nations. Gandhi was unhappy with the lack of support from India's Arab allies during the war with Pakistan, while the Shah was apprehensive at the growing friendship between Pakistan and the Gulf states, specially Saudi Arabia, and the growing influence of Islam in Pakistani society. There was an increase in Indian economic and military co-operation with Iran during the 1970s. The 1974 India-Iranian agreement led to Iran supplying nearly 75 percent of India's crude oil demands. Gandhi appreciated the Shah's disregard of Pan-Islamism in diplomacy. Although independent India was initially viewed as a champion of anti-colonialism, its cordial relationship with the Commonwealth of Nations and liberal views of British colonial policies in East Africa had harmed its image as a staunch supporter of the anti-colonial movements. Indian condemnation of militant struggles in Kenya and Algeria was in sharp contrast to China, who had supported armed struggle to win African independence. After reaching a high diplomatic point in the aftermath of Nehru's role in the Suez Crisis, India's isolation from Africa was complete when only four nations; Ethiopia, Kenya, Nigeria and Libya supported her during the Sino-Indian War in 1962. After Gandhi became Prime Minister, diplomatic and economic relations with the states which had sided with India during the Sino-Indian War were expanded. Gandhi began negotiations with the Kenyan government to establish the Africa-India Development Cooperation. The Indian government also started considering the possibility of bringing Indians settled in Africa within the framework of its policy goals to help recover its declining geo-strategic influence. Gandhi declared the people of Indian origin settled in Africa as "Ambassors of India."] Efforts to rope in the Asian community to join Indian diplomacy, however, came to naught, partly because of the unwilligness of Indians to remain in politically insecure surroundings and partly due to the exodus of African Indians to Britain with the passing of the Commonwealth Immigrants Act in 1968.] In Uganda, the African Indian community even suffered presecution and eventually expulsion under the government of Idi Amin. Gandhi presided over three Five-Year plans as Prime Minister. All but one of them succeeding in meeting the targeted growth. There is considerable debate regarding whether Gandhi was a socialist on principle or out of political expediency.S. K. Datta-Ray described her as "a master of rhetoric...often more posture than policy", while the The Times journalist, Peter Hazelhurst, famously quipped that Gandhi's socialism was "slightly left of self-interest." Critics have focused on the contradictions in the evolution of her stance towards communism; Gandhi being known for her anti-communist stance in the 1950s with Meghnad Desai even describing her as "the scourge of [India's] Communist Party." Yet, she later forged close relations with Indian communists even while using the army to break the Naxalites. In this context, Gandhi was accused of formulating populist policies to suit her political needs; being seemingly against the rich and big business while preserving the status quo in order to manipulate the support of the left at times of political insecurity, such as the late 1960s. Although Gandhi came to be viewed in time as the scourge of the right-wing and reactionary political elements of India, leftist opposition to her policies emerged. As early as 1969, critics had began accusing her of insincerity and machiavellism. The Indian Libertarian wrote that: "it would be difficult to find a more machiavellian leftist than Mrs Indira Gandhi...for here is Machiavelli at its best in the person of a suave, charming and astute politician." Rosser wrote that "some have even seen the declaration of emergency rule in 1975 as a move to suppress [leftist] dissent against Gandhi's policy shift to the right." In the 1980s, Gandhi was accused of "betraying socialism" after the beginning of Operation Forward, an attempt at economic reform. Nevertheless, others were more convinced of Gandhi's sincerity and devotion to socialism. Pankaj Vohra noted that "even the late prime minister’s critics would concede that the maximum number of legislations of social significance was brought about during her tenure...[and that] she lives in the hearts of millions of Indians who shared her concern for the poor and weaker sections and who supported her politics." In summarizing the biographical works on Gandhi, Blema S. Steinberg concluded she was decidedly non-ideological. Only 7.4% (24) of the total 330 biographical extractions posit ideology as a reason for her policy choices. Steinberg noted Gandhi's association with socialism was superficial; only having a general and traditional commitment to the ideology, by way of her political and family ties. Gandhi personally had a fuzzy concept of socialism. In one of the early interviews she had given as Prime Minister, Gandhi had ruminated: "I suppose you could call me a socialist, but you have understand what we mean by that term...we used the word [socialism] because it came closest to what we wanted to do here – which is to eradicate poverty. You can call it socialism; but if by using that word we arouse controversy, I don't see why we should use it. I don't believe in words at all." Regardless of the debate over her ideology or lack of thereof, Gandhi remains a left-wing icon. She has been described as the "arguably the greatest mass leader of the last century." Her campaign slogan, Garibi Hatao (Eng: Remove Poverty), has become the iconic motto of the Indian National Congress. To the rural and urban poor, untouchables, minorities and women in India, Gandhi was "Indira Amma or Mother Indira." Despite the provisions, control and regulations of Reserve Bank of India, most banks in India had continued to be owned and operated by private persons. Businessmen who owned the banks were often accused of channeling the deposits into their own companies, and ignoring the priority sector. Furthermore, there was a great resentment against class banking in India, which had left the poor (the majority population) unbanked.After becoming Prime Minister, Gandhi expressed the intention of nationalising the banks in a paper titled, "Stray thoughts on Bank Nationalisation" in order to alleviate poverty. The paper received the overwhelming support of the public. In 1969, Gandhi moved to nationalise fourteen major commercial banks. After the nationalisation of banks, the branches of the public sector banks in India rose to approximate 800 percent in deposits, and advances took a huge jump by 11,000 percent. Nationalisation also resulted in a significant growth in the geographical coverage of banks; the number of bank branches rose from 8,200 to over 62,000, most of which were opened in the unbanked, rural areas. The nationalization drive not only helped to increase household savings, but it also provided considerable investments in the informal sector, in small and medium-sized enterprises, and in agriculture, and contributed significantly to regional development and to the expansion of India’s industrial and agricultural base. Jayaprakash Narayan, who became famous for leading the opposition to Gandhi in the 1970s, was solid in his praise for her bank nationalisations. Having been re-elected in 1971 on a nationalisation platform, Gandhi proceeded to nationalise the coal, steel, copper, refining, cotton textiles, and insurance industries.Most of these nationalisations were made to protect employment and the interest of the organised labour. The remaining private sector industries were placed under strict regulatory control. Gandhi considered the north-eastern regions important, because of its strategic situation. In 1966, the Mizo uprising took place against the government of India and overran almost the whole of the Mizoram region. Gandhi ordered the Indian army to launch massive retaliatory strikes in response. The rebellion was suppressed with the Indian Air Force even carrying out airstrikes in Aizawl; this remains the only instance of India carrying out an airstrike in its own civilian territory. The defeat of Pakistan in 1971 and the secession of East Pakistan as pro-India Bangladesh led to the collapse of the Mizo separatist movement. In 1972, after the less extremist Mizo leaders came to the negotiating table, Gandhi upgraded Mizoram to the status of a union territory. A small scale insurgency by some militants continued into the late 1970s but was successfully dealt with by the government. The Mizo conflict was definitively resolved during the administration of Indira's son Rajiv Gandhi. Today, Mizoram is considered as one of the most peaceful states in the north-east. andhi contributed and further carried out the vision of Jawarharalal Nehru, former Premier of India to develop the program. Gandhi authorised the development of nuclear weapons in 1967, in response to the Test No. 6 by People's Republic of China. Gandhi saw this test as Chinese nuclear intimidation, therefore, Gandhi promoted the views of Nehru to establish India's stability and security interests as independent from those of the nuclear superpowers. The program became fully mature in 1974, when Dr. Raja Ramanna reported to Gandhi that India had the ability to test its first nuclear weapon. Gandhi gave verbal authorisation of this test, and preparations were made in a long-constructed army base, the Indian Army Pokhran Test Range. In 1974, India successfully conducted an underground nuclear test, unofficially code named as "Smiling Buddha", near the desert village of Pokhran in Rajasthan. As the world was quiet by this test, a vehement protest came forward from Pakistan. Great ire was raised in Pakistan, Pakistan's Prime minister Zulfi Ali Bhutto described this test as "Indian hegemony" to intimidate Pakistan. Gandhi directed a letter to Bhutto and, later to the world, describing the test for peaceful purposes and India's commitment to develop its programme for industrial and scientific use. The government faced major problems after her tremendous mandate of 1971. The internal structure of the Congress Party had withered following its numerous splits, leaving it entirely dependent on her leadership for its election fortunes. Garibi Hatao (Eradicate Poverty) was the theme for Gandhi's 1971 bid. The slogan and the proposed anti-poverty programs that came with it were designed to give Gandhi an independent national support, based on rural and urban poor. This would allow her to bypass the dominant rural castes both in and of state and local government; likewise the urban commercial class. And, for their part, the previously voiceless poor would at last gain both political worth and political weight. The Congress Party split during the election campaign of 1977: veteran Gandhi supporters like Jagjivan Ram and her most loyal Hemwati Nandan Bahuguna and Nandini Satpathy, the three were compelled to part ways and form a new political entity CFD (Congress for Democracy) primarily due to intra party politicking and also due to circumstances created by Sanjay Gandhi. The prevailing rumour was that Sanjay had intentions of dislodging Gandhi and the trio stood between that. A coalition of opposition, under the leadership of Morarji Desai, came into power after the State of Emergency was lifted. The coalition parties later merged to form the Janata Party under the guidance of Gandhian leader, Jayaprakash Narayan. The other leaders of the Janata Party Charan Singh, Raj Narain, George Fernandes and Atal Bihari Vajpayee. The Janata government's Home Minister, Choudhary Charan Singh, ordered the arrest of Indira and Sanjay Gandhi on several charges, none of which would be easy to prove in an Indian court. The arrest meant that Indira Gandhi was automatically expelled from Parliament. These allegations included that she “‘had planned or thought of killing all opposition leaders in jail during the Emergency’”. However, this strategy backfired disastrously. Her arrest and long-running trial, however, gained her great sympathy from many people. The Janata coalition was only united by its hatred of Gandhi (or "that woman" as some called her). With so little in common, the Morarji Desai government was bogged down by infighting. Desai resigned in June 1979 after Charan Singh and Raj Narain formed their own breakaway party. Charan Singh was appointed Prime Minister, by President Reddy, after Gandhi promised Singh that Congress would support his government from outside. After a short interval, Congress withdrew support and President Reddy dissolved Parliament in the winter of 1979. In elections held the following January, Congress was returned to power with a landslide majority. "I am alive today, I may not be there tomorrow. I shall continue to serve till my last breath and when I die every drop of my blood will strengthen India and keep a united India alive." Indira Gandhi delivered her last speech at the then Parade Ground in front of the Secretariat of Orissa. After her death, the Parade Ground was converted to the Indira Gandhi Park which was inaugurated by her son, Rajiv Gandhi. On 31 October 1984, two of Gandhi's bodyguards, Satwant Singh and Beant Singh, shot her with their service weapons in the garden of the Prime Minister's residence at 1 Safdarjung Road, New Delhi. The shooting occurred as she was walking past a wicket gate guarded by Satwant and Beant. She was to have been interviewed by the British actor Peter Ustinov, who was filming a documentary for Irish television. Beant Singh shot her three times using his side-arm, and Satwant Singh fired 30 rounds. Beant Singh and Satwant Singh dropped their weapons and surrendered. Afterwards they were taken away by other guards into a closed room where Beant Singh was shot dead. Kehar Singh was later arrested for conspiracy in the attack. Both Satwant and Kehar were sentenced to death and hanged in Delhi's Tihar jail. Indira Gandhi was brought at 9:30 AM to the All India Institute of Medical Sciences, where doctors operated on her. She was declared dead at 2:20 PM. The post-mortem examination was conducted by a team of doctors headed by Dr. T.D Dogra. Dr. Dogra stated that as many as 30 bullet wounds were sustained by Indira Gandhi, from two sources, a Sten gun and a pistol. The assailants had fired 31 bullets at her, of which 30 had hit; 23 had passed through her body while 7 were trapped inside her. Dr. Dogra extracted bullets to establish the identity of the weapons and to correlate each weapon with the bullets recovered by ballistic examination. The bullets were matched with respective weapons at CFSL Delhi. Subsequently Dr. Dogra appeared in the court of Shri Mahesh Chandra as an expert witness (PW-5), and his testimony lasted several sessions. The cross examination was conducted by Shri P N Lekhi, the defence counsel. Gandhi was cremated on 3 November near Raj Ghat. The site where she was cremated is today known as Shakti Sthala. Her funeral was televised live on domestic and international stations, including the BBC. Following her cremation, millions of Sikhs were displaced and nearly three thousand were killed in anti-Sikh riots. Rajiv Gandhi on a live TV show said of the carnage, "When a big tree falls, the earth shakes." She was married to Feroze Gandhi. Firstly, her younger son Sanjay had been her chosen heir; but after his death in a flying accident in June 1980, his mother persuaded a reluctant elder son Rajiv Gandhi to quit his job as a pilot and enter politics in February 1981. Over a decade later, Rajiv Gandhi was assassinated. ndira Gandhi was a famous politician, but she is likely to be a controversial choice for the greatest woman of the past 1,000 years. The only child of India's first prime minister, Jawaharlal Nehru, Indira Gandhi was herself elected prime minister in 1966. She served four terms, three of which were consecutive. She studied at Visva-Bharati University in India, and Oxford University. In 1938, she joined the National Congress party and became active in India's independence movement. As prime minster in 1971, Indira Gandhi led India in a war against neighbouring Pakistan which resulted in the creations of Bangladesh, formerly East Pakistan. Her role in the war was only one of her controversial actions. She is remembered most for her campaign against Sikh separatists. When Sikh extremists used violence to demand an independent state in Punjab, she ordered an army attack on their refuge, the holiest Sikh shrine, the Golden Temple in Amritsar. The June 1984 attack killed an estimated 450 people, and left a legacy of bitterness. Five months later, Indira Gandhi was shot dead by her Sikh bodyguards in revenge. That incident was followed by attacks on Sikh communities in Delhi and elsewhere in India, in which several thousand people are believed to have died. BBC News Online readers from across the world took part in the millennium poll and those who voted for Indira Gandhi praised her leadership skills and strength. Khalid Ahmed said: "She was a true feminist to the core, a woman of substance who helped the country through a testing phase, possessed all the virtues of a woman and fought valiantly for women's rights in a man's world." And according to Geetha Sankaran, she was "a dynamic leader and worked for the uplifting of India and its women."